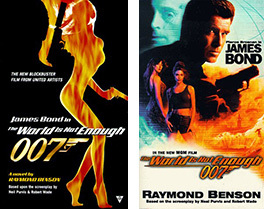 Raymond was the third—and first American—continuation author of the official James Bond novels between 1996 and 2002. Some titles may be out of print on paper, but they are available as ebooks and audiobooks, and/or in the second-hand market. Check out selected reviews of these titles here. In the Australian desert, a nuclear bomb explodes. In England, two police officers are shot dead when they investigate a cargo in Portsmouth dock. And in Hong Kong, an explosion rips through one of the colony’s famous floating restaurants, killing the entire Board of EurAsia Enterprises Ltd, a multi-billion dollar shipping corporation. These apparently random events are connected—and 007 must find out how and why. Traveling to one of the world’s most exotic locations, James Bond encounters such diverse characters as a mysterious British taipan, a sinister Triad leader, a sadistic Chinese general and an enchanting exotic dancer—and eventually comes face to face with one of the most formidable adversaries of his career. Following leads to Texas, Bond fears he will uncover an international scandal that could engulf his service and his country. Instead, he finds his first trace of the Decada. Held together by archaic philosophy and their own bizarre rituals, the Decada’s fanatics have stockpiled a terrifying range of poisons and are willing to use them for further insane ambitions for power and revenge. Aided by beautiful, brave Greek intelligence agent Niki Mirakos, Bond puts himself into the firing line for a last ditch attempt to stop the Decada before they unleash a horrifying weapon on their helpless prey. When information vital to Britian’s national security is stolen by a shadowy organization called the Union, the trail leads Bond from one of England’s most exclusive golf clubs to the cosmopolitan city of Brussels, and finally to an expedition up the icy heights of the legendary mountain Kangchenjunga, the third tallest peak in the world. In his most thrilling adventure yet, Bond must pit his strength and guile against two deadly adversaries – the forces of nature at high altitude and the most resourceful criminal minds he has ever encountered. The intricately organized criminal conspiracy called the Union has vowed its revenge on the man who thwarted its last coup. Now, the Union’s mysterious leader sets out to destroy James Bond’s reputation and sanity by luring the agent into a dangerous alliance of deceit and treason with a Spanish militant intent on reclaiming Gibraltar. Officially on medical leave as a result of a head injury sustained on his last adventure, 007 ignores M’s orders and pursues clues that he believes might lead him to the Union’s inner circle. His search takes him from the seedy underbelly of London’s Soho to the souks of Tangier; from a terrorist training camp in Morocco to a bullring in Spain; and from the clutches of a murderous Spanish beauty to a volatile summit conference on the Rock of Gibraltar. Each step brings 007 closer to the truth about the Union’s elaborate, audacious plot to destroy both SIS and its best agent: James Bond. In Raymond Benson’s chilling new James Bond novel, 007 comes face to face at last with the most cunning criminal mastermind he has ever fought—the blind genius behind the brutal organization called the Union. It begins at a movie studio in Nice, where a police raid goes horribly wrong, with innocent men, women and children killed. It continues in an English prison, where a corpse discloses an intriguing secret about the Union. The trail leads James Bond to Paris, where he meets the tantalizing movie star Tylyn Mignonne and embarks on a voyage of sensual discovery. But Tylyn is in mortal danger. Her former husband, a volatile French film producer, has not forgiven his glamorous ex-wife for ending their troubled marriage—and he is connected to the Union’s thugs. Meanwhile Bond’s friend Mathis, a French agent, has disappeared while tracking down the Union’s mysterious leader, Le Gerant. Bond’s search for Mathis takes him to a thrilling underwater brush with death, a chase through the Corsican wilderness, a surprise encounter with an old friend—and a final confrontation with a twisted criminal genius. On a quiet late-night flight from Tokyo to London, a beautiful young woman, Kioko McMahon, falls ill. Before the plane can reach emergency medical facilities across the Pacific, she succumbs to her inexplicable symptoms. The mystery deepens when police in Japan discover that her family shared her fate. The only survivor is her rebellious sister, Mayumi, who had run off with her gang-member boyfriend several years before. Because the late patriarch of the family, Peter McMahon, was the head of one of the world’s most important genetic research companies, and a personal friend of the Prime Minister, James Bond is sent to investigate the deaths. 007’s quest for answers leads to the surviving sister and to a nest of Yakuza gangsters. Along the way, he uncovers a plot of such monstrous proportions that it could only have been hatched in the mind of a madman. An anthology containing three of Raymond Benson’s James Bond 007 novels—High Time To Kill, Doubleshot, and Never Dream of Dying. The book also features the never-before published (in English) full-length short story “Blast from the Past” and a new introduction by the author! 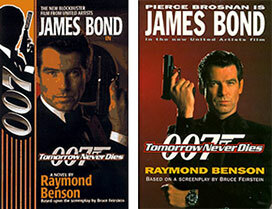 A second anthology containing three of Raymond Benson’s James Bond 007 novels—Zero Minus Ten, The Facts of Death, and The Man with the Red Tattoo. The book also features two rare short stories, “Live at Five” and “Midsummer Night’s Doom,” and a new introduction by the author! And enough facts, figures, and miscellanea to satisfy even the most ardent fan. NOTE: This book is now rare and out of print in all print editions. However, it is currently available as an ebook! A new print edition is coming soon. A man who can start a war anytime and anyplace—and profit from it—would be the most powerful man in the world. Elliot Carver knows this. And he has a plan to turn his media conglomerate into a true empire, exploiting global conflicts he creates with on-the-spot news coverage guaranteed to bring him the highest ratings in television history. It starts with a sudden mysterious skirmish that leaves two Chinese MiGs and a Royal Navy frigate at the bottom of the South China Sea. It could end with an all-out world war on live TV. But there is one man who can stop it… James Bond. His name is Renard. A bullet lodged in his brain has rendered him unable to feel physical pain, and he has but one reason left to live—revenge. There’s only one man who can take the heat between a beautiful heiress, a malicious sociopath and his final diabolical plan. The action-packed story begins in a demilitarized zone between North and South Korea with a spectacular high-speed hovercraft chase. From Hong Kong to Cuba to London, Bond continues his quest to unmask a traitor and prevent a war of catastrophic consequence—but not without the help and hindfrance of two mysterious femmes fatales. Hot on the trail of the principal villains, Bond travels to Iceland, where he experiences at first hand the power of an amazing new weapon before a dramatic confrontation with his main adversary back in Korea where it all started.